The next generation of performance tires from Michelin is here, and none is faster than their Power Competition model that uses a Race Compound developed from Michelin's MotoGP department. 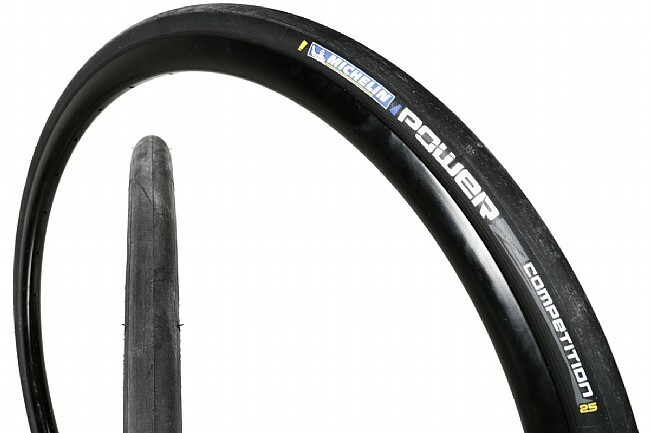 Compared to the Pro4 Service Course, this new compound helps the Power Competition save 10 watts of rolling-resistance, which is the equivalent of shaving 1:25 minutes over 25 miles at about 22 mph. Michelin admits the savings aren't as drastic when compared to the old Pro4 Comp race-only tire, but an increase in speed is still notable, as are the significant improvements to wet-grip and puncture protection. Great tire... IF you are racing on smooth, well cared for pavement. I have enjoyed training and racing on the Michelin Pro 4 Service Course in past seasons. I decided to treat myself to a set of the new Power Comps for my spring target race. I wish I had done a recon ride. The pavement condition was sketchy at best. The Power Competitions have very thin sidewalls. I cut a sidewall at some point during the race and it finally exploded one mile before the finish. Ultimately, I fault myself for not using the right tire (but I will forever HATE this tire). I not sure they actually felt all that great. They are light, but not super light. Traction was fine, but nothing spectacular. And yeah, the sidewalls are an issue unless you are racing them (and only racing) on really nice pavement. I'm back on Conti GP 4000 2S. I will say that WBW was phenominal. They refunded my purchase of the used (unpunctured) tire. Seriously great service always! Reasonably quick and they look cool. Decided to break out of my usual yearly gp4000 order and am writing this stranded after about 200 miles on the tires (had two tubes). They are fast, feel great around corners but are not strong enough for where I ride it seems. Recommend for smooth pavement. Will probably keep the fronts on but order another continental for the rear.